What is the COUNTBLANK Function? The COUNTBLANK function is categorized under STATISTICAL functionsFunctionsList of the most important Excel functions for financial analysts. This cheat sheet covers 100s of functions that are critical to know as an Excel analyst. COUNTBLANK will count the number of empty cells in a given range of cells. In financial analysis, the function can be useful in highlighting or counting empty cells in a given range. Range specifies the range of cells in which we want to count blank cells. Any cells that contain text, numbers, errors, etc. are not counted by this function. Formulas that return empty text (“”) are considered blank and will be counted. So, if a cell contains an empty text string or a formula that returns an empty text string, the cell is counted as blank by the COUNTBLANK function. Cells that contain zero are considered not blank and will not be counted. 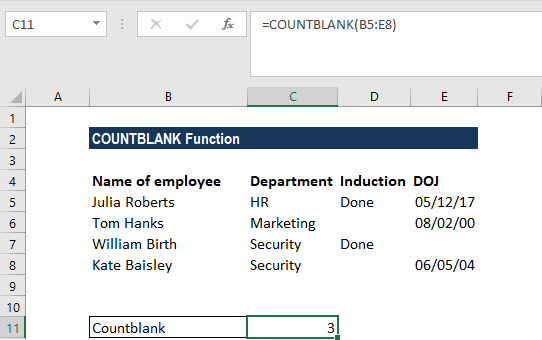 How to use the COUNTBLANK Function in Excel? 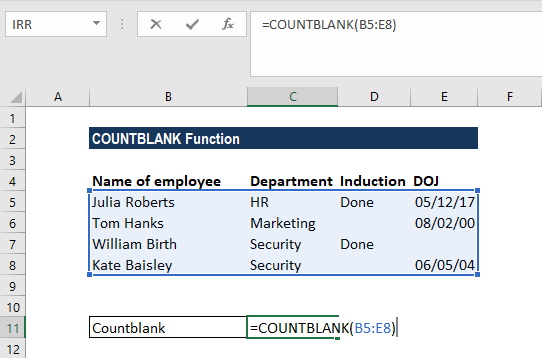 If we wish to know the number of cells that are empty, we can use conditional formatting using the COUNTBLANK function. If we want, we can use conditional formatting to highlight rows with empty cells using the COUNTBLANK function. Select the desired range, and on the select conditional formatting and apply the COUNTBLANK() function. This will then highlight all the cells that are Blank on the desired range.